RENT A DUMPSTER IN ORLANDO or the GREATER ORLANDO AREA! We deliver a clean and empty dumpster right to your driveway; you fill it up and call us, then we pick it back up & dump it for you! We strive for same day delivery! Order by 10AM and will do our best to provide same day service! NEED JUNK REMOVAL? NEED HELP LOADING JUNK INTO YOUR DUMPSTER? WE DO THAT! Just let us know when you order and we will provide a FREE quote for our insured staff to load the dumpster! If you got junk, we can help load and take it away! Our dump trailer rental bins have walk-in doors. These are easier to load than waste management disposal bags or dumpsters you have to lift everything over the top of. When you rent a dumpster you want to make the hard loading job as easy as possible. You can also have our insured staff remove your junk for you! 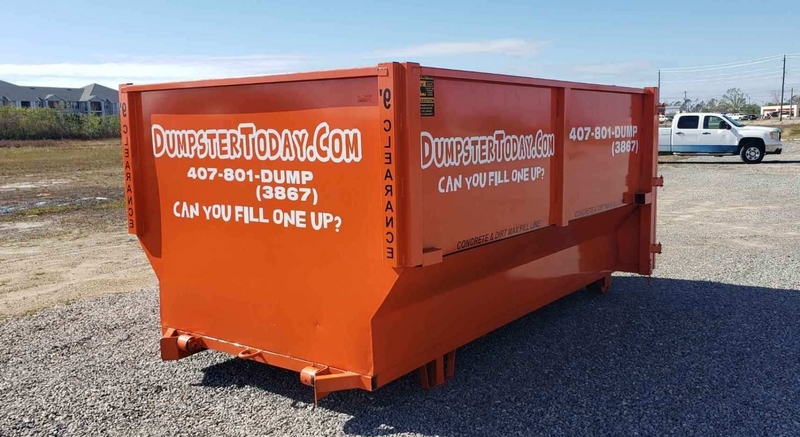 DUMPSTERTODAY.COM IS A LOCALLY OWNED & FAMILY OPERATED DUMPSTER RENTAL DELIVERY AND RECYCLING BUSINESS LOCATED IN CENTRAL FLORIDA. Our ordering is easy- no waiting days to get a delivery scheduled! We will offer 100% online dumpster rentals via computer or smart phone. With Dumpster Today you won’t have to call in and answer a thousand questions just to find out ‘they’ don’t have any dumpster to rent you anyway… With DumpsterToday.com you simply click the dumpster size you need, select a day, sign the online signature service agreement, make the payment and you’re DONE! A Dumpster delivery will be on the way! AT DUMPSTERTODAY.COM YOU PAY THE SAME PRICE NO MATTER WHICH TYPE OF DEBRIS YOU ARE USING THE DUMPSTER FOR! You simply tell us what kind of trash you are using the dumpster for (per dumpster you can choose Household goods and construction material, OR Recyclable yard debris) and you get one set rental price – plus your 1st ton of weight to dump is included FREE in the rental price!! DELIVERY IS Guaranteed On Time – Every Time!! We keep your costs down with the lowest rental cost and the lowest per ton dump rate! We include the first ton (2,000 lbs!) free in the rental rate! Our competitors have a complex process you have to go through before renting to you! Dumpster Today has simplified the process and offer *Same Day Delivery when you order by 10AM! Please take the time to read our reviews. All our deliveries come with a smile and helpful advice! For those that need help loading the dumpster, we offer an hourly rate for loading support and have a kind and helpful team to support clean-outs! 4 - READY, SET, FILL IT UP!!! 5 - SCHEDULE YOUR PICK UP! Fill out the easy order form & choose your delivery date and time, then submit the form. Our dumpster rental comes with 1 Free Ton (2,000 lbs.) of weight included in the price! Easy checkout and pay online using a credit card through paypal. We will call you to confirm the details of delivery! If you don’t want to use paypal, after you place your order, you may call us to provide payment over the phone. We need a 9 foot wide, cleared-off, flat and drive-able surface to unload the dumpster PLUS 14 feet of clearance height from the ground to tilt-load and unload our dumpster safely. Our dumpster delivery is safe for driveways. Some renters put plywood or 2x4s down. If you provide the wood, our drivers will place the wood under the legs and wheels of the dumpster. Load your dumpster easily using the walk-in, barn-door style doors which give you access to walk inside and make the most of your dumpster capacity! With our dumpsters you can make sure the space is being used wisely. Go ahead and fill it all the way up to the top – but not over! We must have all permitted items safely below the edges and the top. Easy to do with our walk-in style dumpster! With our comfortable rental options, you can take your time or knock out your trash removal task in one day. Just call us to arrange a pick-up and we’ll have it out of your way! READY TO START YOUR DUMPSTER ADVENTURE?? WE HAVE TWO SIZES. HOW BIG ARE THEY? Our 12 Yard Dumpster is Large! This is our value dumpster rental for large jobs around the house or small remodeling jobs. 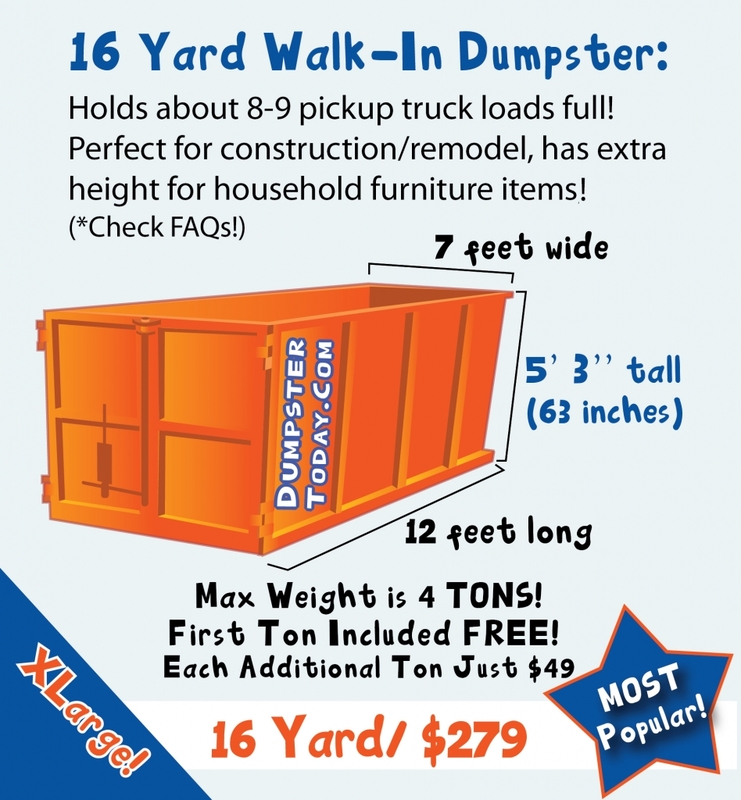 The volume of our 12 yard dumpster is similar to what would fit in 6 to 7 pick-up truck loads. 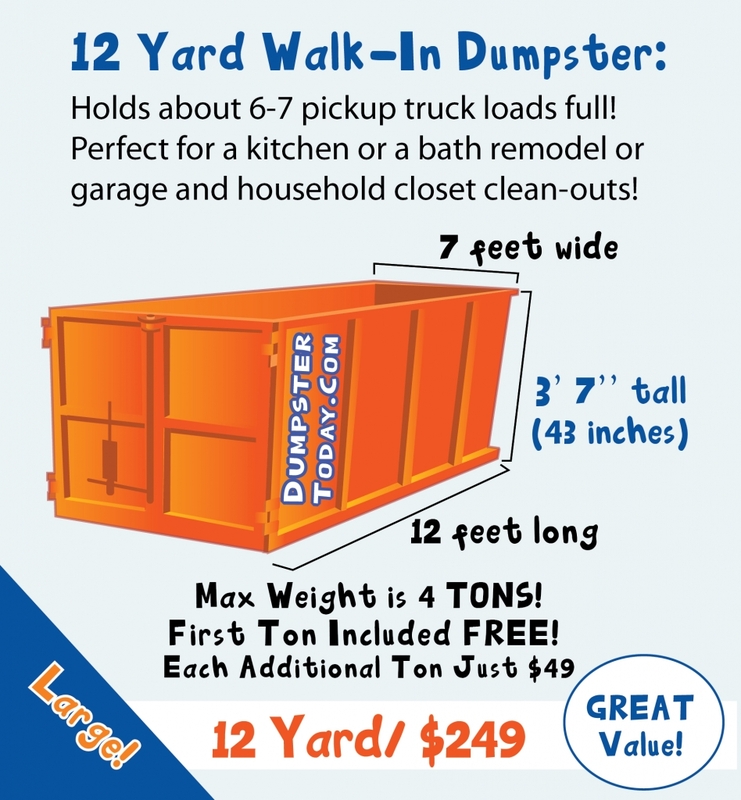 This size dumpster is perfect for a household bathroom or kitchen remodel, cleaning out the garage or closets and sheds. You can also use our 12 yard dumpster for landscaping debris clean-up, but please keep in mind not to mix ‘recyclable yard and landscaping debris’ in the same dumpster with household or construction remodeling trash. These items go to different dump stations and cannot be combined. Make sure to read our FAQs to learn more! Our 12 Yard Dumpster Rental can also be used for construction debris like roofing materials, drywall and construction material tear-outs. Save yourself the drive(s) to the dump and figuring out the dump fees. Just call Dumpster Today for a pick-up when done and we handle the rest! Our 16 Yard Dumpster is Extra Large! This is our most popular dumpster rental in Orlando. Most bang for your buck! Perfect for big jobs, our 16 yard dumpster can hold 8-9 pick-up truck loads of trash or debris. Our 16 Yard size dumpster also gives a little extra height to ensure your trash doesn’t exceed the height of the sides of the dumpster. Clean out your house, garage and shed and add pieces of furniture or large items with ease. You can rent a dumpster just for tree jobs and landscaping re-dos. Large debris fits easily inside and you can walk right in with it to stack it and make the best use of the space. Just keep in mind that you cannot mix tree limbs and landscaping debris with household and construction/remodel trash. Just choose which use per dumpster! Our 16 Yard Dumpster Rental can also be used for construction debris like roofing materials, drywall and construction material tear-outs. While we do not allow concrete, asphalt, brick, or dirt loads, small amounts may be included in construction material (loaded carefully not to damage the dumpster through our walk-in doors). Please do not go over the top or put hazardous materials in your dumpster! We have heard it’s not much fun to load, unload and reload dumpsters!! Perfect for big jobs, our 16 yard dumpster can hold 8-9 pick-up truck loads of trash or debris. Our 16 Yard size dumpster also gives a little extra height to ensure your trash doesn’t exceed the height of the sides of the dumpster. Clean out your house, garage and shed and add pieces of furniture or large items with ease. You can rent a dumpster just for tree jobs and landscaping re-dos. Large debris fits easily inside and you can walk right in with it to stack it and make the best use of the space. Just keep in mind that you cannot mix tree limbs and landscaping debris with household and construction/remodel trash. Just indicate which choice you are using it for on the order form! Our 16 Yard Dumpster Rental can also be used for construction debris like roofing materials, drywall and construction material tear-outs. While we do not allow concrete, asphalt, brick, or dirt loads, small amounts may be included in construction material (loaded carefully not to damage the dumpster through our walk-in doors). Please do not go over the top or put hazardous materials in your dumpster! We have heard it’s not much fun to load, unload and reload dumpsters!! We are happy to bring our trash container rental to you! Save yourself the drive(s) to the dump and figuring out the dump fees. Just call Dumpster Today for a pick-up when done and we handle the rest! Our Trained, Insured and Experienced Teams can help you load the dumpster! Just check the box requesting a quote and we will call you to get the details. Our quote will be upfront and clear. If you need quality, experienced, capable, and confident help to clean out a property, let us know! You can trust us when a big project comes up at your property, your home, or your business. You can be confident when you turn to the experienced, trained, and insured Dumpster Today teams for help! READY TO RENT YOUR DUMPSTER? "CAN YOU FILL ONE UP?" We deliver a clean and empty dumpster right to your driveway; you fill it up and call us, then we pick it back up & dump it for you! We strive for same day delivery! Order by 10AM and will do our best to provide same day service! When you rent a dumpster from Dumpster Today, you get walk-in style doors so you can walk right in to load your items! This makes big jobs a breeze! Our process is fast and easy! You can order in a matter of minutes. We have streamlined the process! Don’t wait days to get your delivery scheduled. © Copyright 2018 | Dumpster Today | All Rights Reserved | Marketing by ItsCardinal, Inc. Working by yourself, worried about the liability of someone getting hurt, or don’t have the strength to lift large items over the top of a dumpster? Our dumpsters are for you! Our dumpsters have WALK-IN STYLE, gate-swing barn-doors so you can walk right in with your items! This makes big jobs a breeze! From our good standing with clients, great references and reviews from customers to the approval of every major insurer in the U.S., you know you’re in good hands and can have confidence in good outcomes when you call Dumpster Today.